Beloved, since August has come, it seems I have a tsunami inside me. I do not know if a light went on, and due to it I have become desperate for seeing everything that was in the shadow or what it is about. I know that this movement has brought me deep sorrow, with a mixture of despair. I came across my lack of self-love again and everything that comes from it. Problems in relationships, dissatisfaction. Do not know. And I began to look again, to try to heal my inner wounds. To love me, to accept me. But I've tried it in so many ways. It seems that I cannot really try to love myself without approval from the other. I do not know if I'm guilty, I do not know what it is. But I try to clean with ho'oponopono, I'm trying to meditate again to reconnect. I do not know what to do. In my relationship there are frequent fights, accusations. But I really love this person and I really wanted to make it right between us. That we could maturely see each other and grow together. But I do not know. I see myself hopeless on my walk again. Sometimes I get the feeling that I try, try, try and I still stuck on the same place. I am looking inward, trying to see into myself, but now after having seen everything in me, I feel bad for not being able to transmute and change it in myself. Please, my beloved, give me a direction? A practice, a thought. I don't know. Help me transmute this, please. I open myself to receive with love. Gratitude. Daughter, you will only find the sweet taste of life again, when you let go of this incessant search for improving something, for healing something, for transmuting something. Realize that you are creating a reality of suffering within a new life that you have just begun. You are repeating a pattern. And this pattern is nothing more than the negation of your state of full happiness in the present moment. Those who live with you feel in you this pressure, this incessant quest to improve, heal, transmute, something that simply exists only in your mind. For this reason, daughter, just let it go. Give yourself time to feel your own life, breathe and savor the sweet present moment. Hello, beloved siblings of the blog, loving greetings. 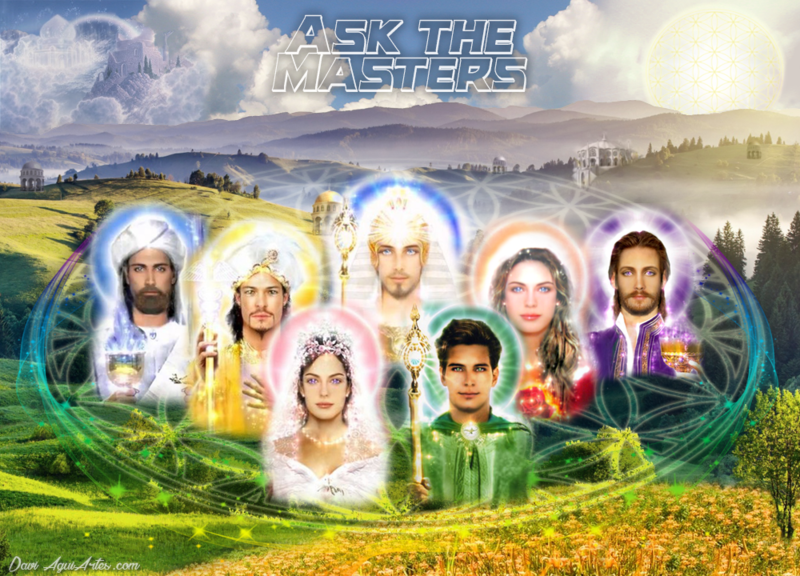 It is an immense spiritual honor and infinite gratitude to be able to question the Masters. My question is this: Why, despite all my effort and commitment to pursue the profession I so dream of, cannot I reach my goal? I am one of the best in my field and it still does not happen, it seems that I always return to the same point. I see people getting the opportunities I deserve, and no matter how much I let go and work hard, it does not flow. Another important question is: Am I who I know I was born to be, or could I have taken a different path and changed my reality in a distorted way? I feel that I was born for something important, and that I'm on the right track, but things do not seem to happen. I have a strong connection with our stellar brothers, but I would like to open up my psychic potential much more, which is limited only to the energetic perception of places and events. I have many journeys through astral planes and of totally different dimensions from mine, am I doing some important work? What would it be? Last question and no less relevant, why whenever I dream, I start in dreams either where I grew up, or in the residence of my grandparents? Almost all begin or pass in these places, and change between different places afterwards. Peace and light to all. You know that you carry the genetic baggage of the environment in which you were born. And so it will always be while you are in that experience. That's completely normal, son. But it turns out that you deny going forward, opening up to new opportunities, which are not possible to materialize in your mind. By carrying with you certain certainties, you end up blocking the opening of the new. Therefore, you only need to give your life to chance, to the divine. Live the present by observing the experiences that are presented, and absorb those learnings completely. Learn to transcend feelings that bring you dissatisfaction and doubts, and open up yourself to be happy in the here now. Only in this way you might be able to move towards your purpose. For it is nothing more than to attain the state of peace and fullness while living in the physical body, in the here and now, in matter. HOW TO LIVE IN THE FIFTH DIMENSION? WHY CAN´T I ACHIEVE MATERIAL ABUNDANCE? Greetings, Masters! I feel like my life is stuck, no matter how much I accept it to change, how attentive I am inside to see what I can do. This has happened for years/decades, but lately it seems like all the possibilities for progress are gone. In a way, I'm using a lot of energy just to survive and in a very poor way. There is no point in thinking that it is not, but money is the fulfillment of all the creativity that I try to make real, and it flees from me like the devil of the cross. There is a lot of subject matter about the "old" ways of creating in 3D and the "new" ones of 5D. This is the conflict in which I find myself. Allowing and getting into the flow, such as the "new" way of creating in 5D, is an art that I do not master but have few successful references to the attempts I've made. Unfortunately for me, the contact with 5D requires a very delicate state of mind, which is difficult to achieve and maintain in need and working in 3D. What is missing for me to do/learn and/or raise awareness, so that I reverse this condition, if that is part of my life mission? Excuse me, but I'm so tired of this story that I just feel like kicking the bucket. Thanks in advance for your attention. The will that calls your heart, son, is only to feel the peace and fullness, without the charges and demands that matter requires. Your only will is to be free, and that is not related to any material conditions as you think. Your quest for the state of fullness and abundance is what distance yourself from it. It is as if you lived on a beautiful beach in front of the sea, and longed to know the sea for life. Without even realizing what is already there with you all the time. The state of abundance is simply the acknowledgment and acceptance of your present moment and the observance of abundance in it. Even if a small portion of abundance is observed, and seen as grandiose and blessed, yet by the law of resonance it will multiply. Therefore, it is only by means of acceptance and gratitude that you will be able to bring the resources you desire, or even that you will awaken to the opportunities you need. It is the journey that will lead you to find this feeling of gratitude and acceptance of the present, from which everything will happen. Exercise charity, inner observation and gratitude, and open the doors that have been kept closed and prevented from receiving the flow of abundance that is already part of your life.